Maasai Mara National Reserve, Kenya. This evening, the low angle of the sun is spreading muted photons of light all around. A family of zebras is grazing peacefully near me. 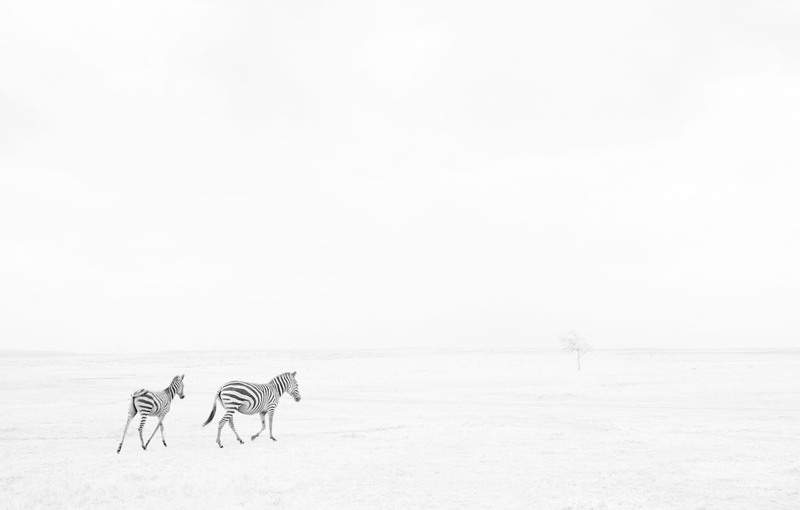 In the distance, a stallion of another zebra family yelps like a dog. The zebras are as free as the wind across this land that has been their home since the time when we came down from the trees. I feel this is nature at its best – alive and at peace - and I hope the photograph I take conveys this serenity in which undisturbed zebras serve as an anchor into nature’s magic. Maasai Mara National Reserve, Kenya. Not a morning to cheer you up with lots of bright light. Instead, it is a morning that feels half asleep. 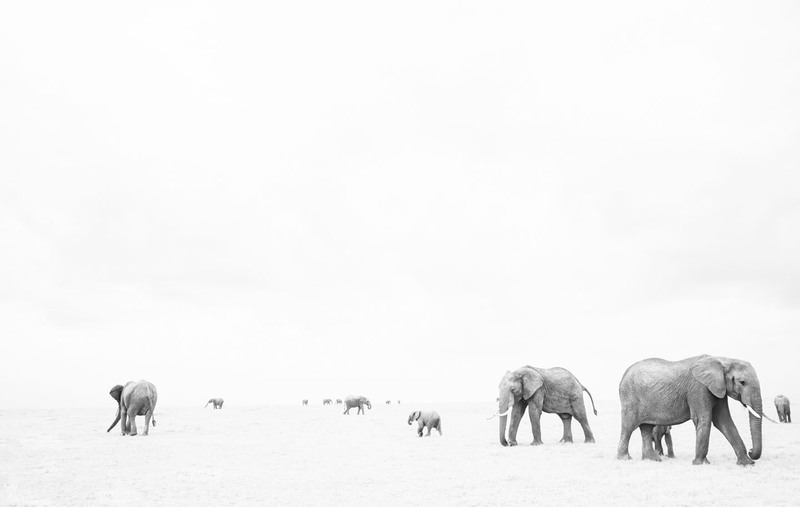 As I drive through the bland landscape, I encounter a herd of elephants contentedly grazing on the vast plains. I stay with them, looking for a photograph that would depict an act in which they are momentarily still, together yet apart, like a tableaux of peaceful co-existence. Maasai Mara National Reserve, Kenya. There is no sunrise on view this grey morning. It feels as if the land is reluctant to stir from its nocturnal sleep. I am with a group of giraffes who are aware of my presence but do not give, in their exceedingly polite way, any outward sign that they mind. I am looking for a photograph to decorate the land with this the most African of animals. 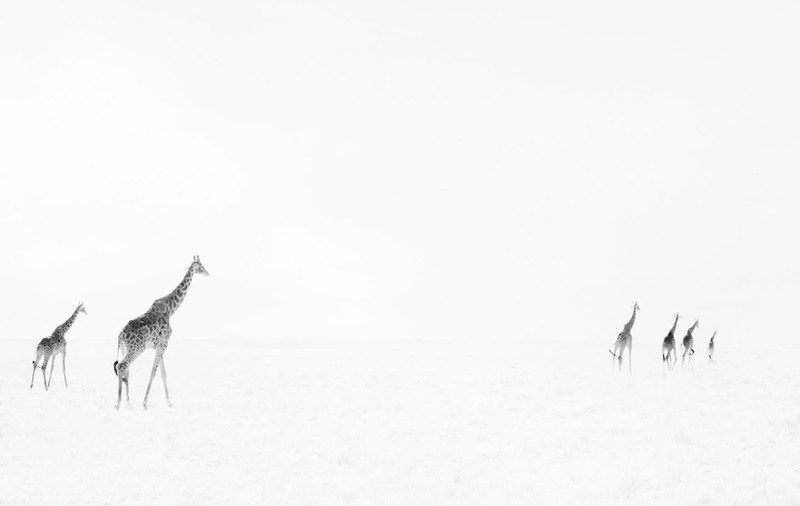 The opportunity occurs when the relaxed giraffes arrange themselves into multiple acts of being themselves. Maasai Mara National Reserve, Kenya. I can feel the warm rays of the morning sun teasing my back. I am following two cheetah sisters who have recently separated from their mother. 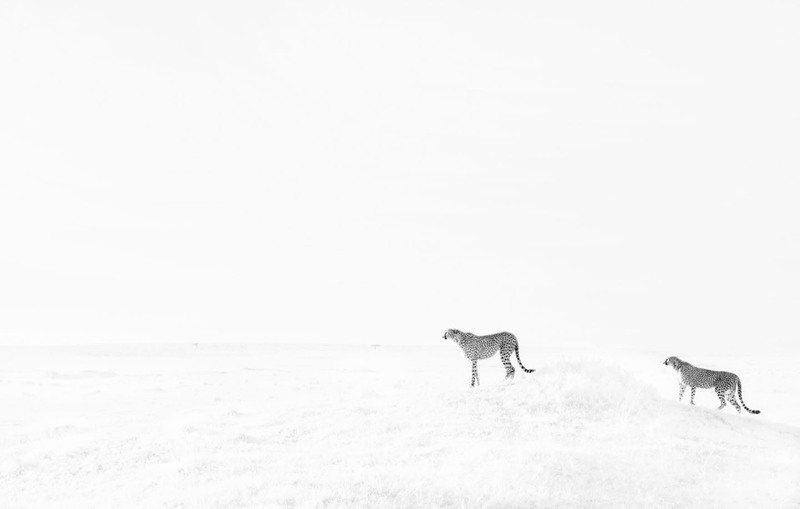 I want to photograph these shy creatures of the plains going about their daily lives, betraying their feline nature. The opportunity occurs when engrossed in their task of looking for gazelles to hunt, they climb a mound from which to scan the plains. Looking at the resulting photograph now, it feels that they are really not doing much except just being in their space. Maasai Mara National Reserve, Kenya. A morning of low still clouds, waxy grey with the weight of this indifferent cover. I am with a lioness on a kill waited upon by a clan of hyenas. I notice that the hyenas are resigned for a long wait. My idea to photograph them as a tableaux looks possible. After a while, the lioness gets up, advances, and faces the hyenas. For a split second, all action is frozen. Will she or won’t she? Maasai Mara National Reserve, Kenya. This morning is muted: no bright streaks of light in the sky, no elemental dramas on the savanna. 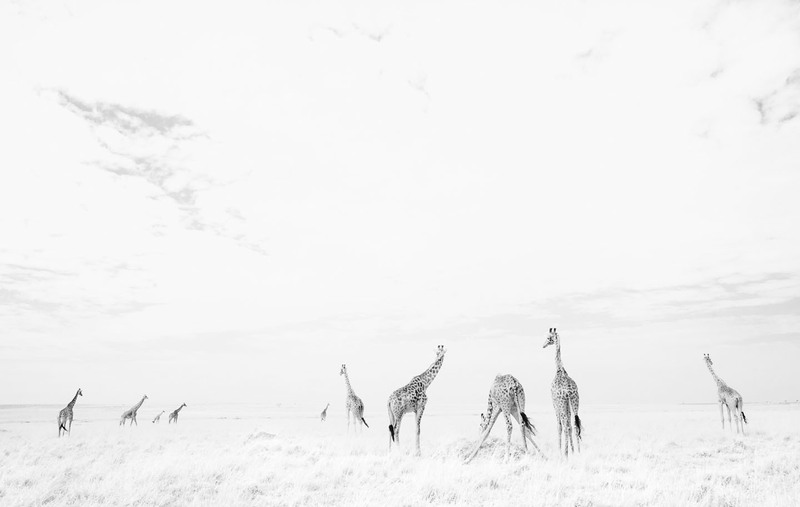 I am with a group of giraffes traversing the open plains, going from one woodland to another, a few miles apart. 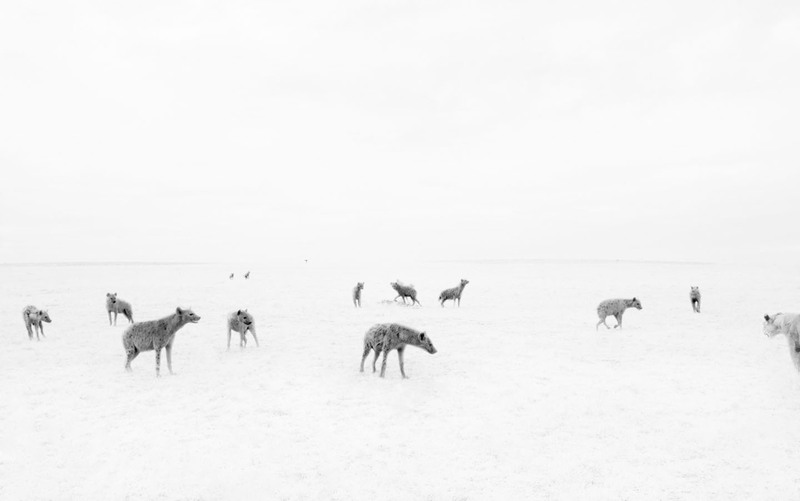 I am looking for a photograph that communicates their oneness with the land. The opportunity occurs when they form a line that seems to fade into the distance. Involved in their trek, they move sedately to their destination. Content and form blend. After accepting the photograph I ponder: what giraffe would choose to live in captivity and never feel the reassuring earth beneath its feet and the soft wind against its cheek? Maasai Mara National Reserve, Kenya. There is a light breeze this morning that gusts now and then. I come across a lion couple stretched out like monumental statues comfortably on the grass, facing each other. Occasionally, the mane of the male lion streams in the wind. There seems to be an unspoken bond between the pair and I am hoping to reveal it in a photograph. After a while he rises, stretches and swaggers. Then he bows his head down as if to whisper some secret to her. My wish comes true. Maasai Mara National Reserve, Kenya. A morning of low hanging clouds and vanquished sun. I am waiting on the plains, illogically feeling free and primed to express my sense of freedom. I spy a bull elephant lording over the plains for everyone to see, making his way to nowhere. I note his progress in his grand manner, compose, click and think: Sometime in the past, long before the tyranny of industry, a free human being must have stood on the same spot that I am standing on now. Like me, he saw a mature bull elephant walking contentedly on the plains. Maasai Mara National Reserve, Kenya. A morning dominated by shades of grey overhead. Out on the plains, I am watching a family of elephants. I believe, when undisturbed, elephants are unhurried and measured, creating a curious area of calm around them. I would like to transform that view into a photograph. The opportunity occurs when they form into a slow moving line. They walk with a regal gait and as I click, I see dignity on show, all the more pronounced because of their bulk. Maasai Mara National Reserve, Kenya. 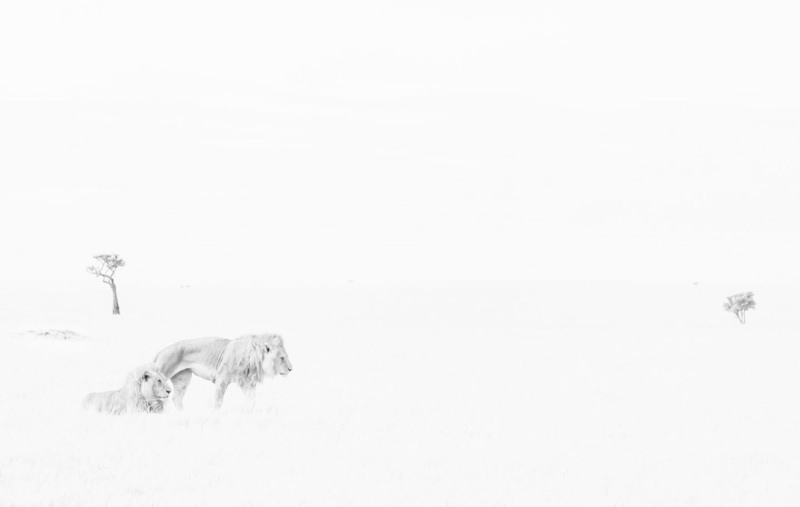 I wander across the plains this chilly morning and presently encounter two male lions. Even though they are resting, there is palpable tension all around. They ignore me with disdain. I wait and feel the chill in the air fade. Then the photograph I would like materializes - the males get up in turn, exhibiting the latent power of their kind. Maasai Mara National Reserve, Kenya. The track I take has not been used for a long time but it leads to where there is a promise of serendipity. Presently, I come across over thirty ostriches delicately traversing the plains, nimble footed large chicken fairies darting here and there in slow motion. I imagine their choreography on a white stage and wait for it to coalesce into a mystic moment. Maasai Mara National Reserve, Kenya. I do not have to travel far this morning before encountering elephants, seemingly everywhere. I watch their bodies align and re-align to form geometries as they graze on the move. Waiting to photograph an unexpected pattern I hope to like, I think today photography has turned extremely pleasurable. Maasai Mara National Reserve, Kenya. It is a morning in which clouds and sun try to obliterate each other. 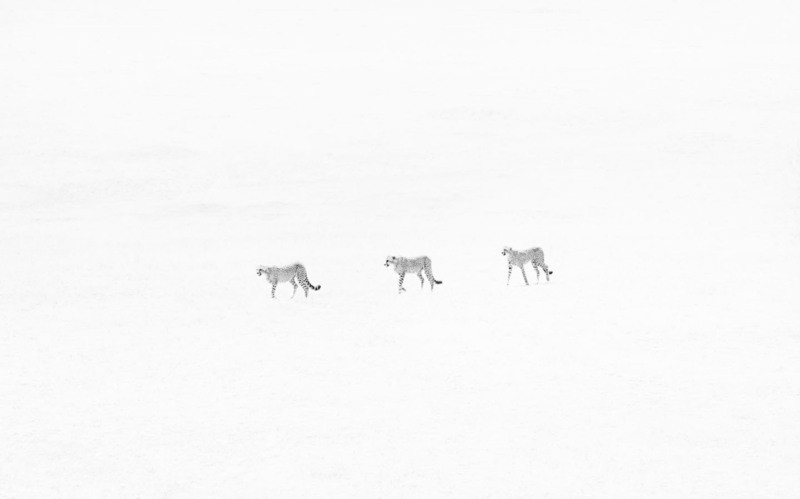 Walking across the plain is a cheetah called Amani with her three cubs in tow. As the sun wins, the day turns lazy. Amani reads the cue and flops in the shade of a bush that cannot possibly shelter all four of them. Having chosen the background, I wait for the cats to get up and fall into a formation. It is a long, long wait. At last, the ever vigilant Amani gets up to investigate the meal potential of a lone male impala on the horizon. The cubs are pulled by habit to follow her in an obedient line. Maasai Mara National Reserve, Kenya. As I set out this morning, my mind is in a whirl, trying to figure out technical problems with the camera equipment and mechanical niggles with the car. 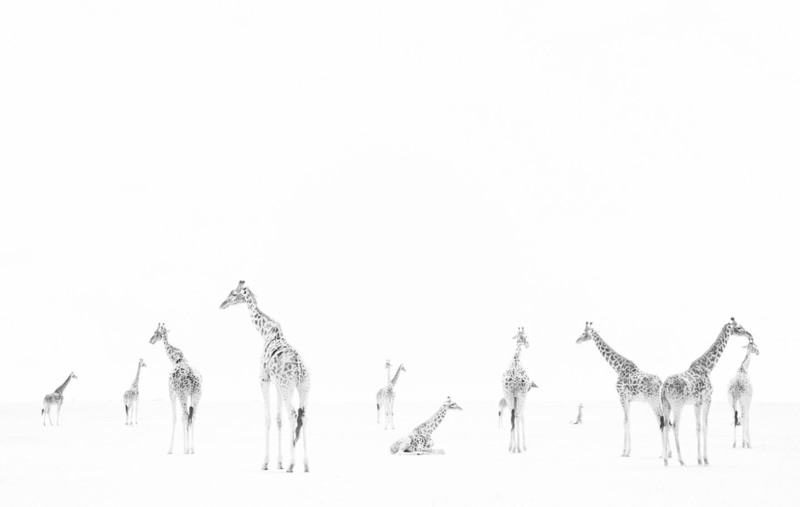 I come across a large group of giraffes and stop to think my way through possible solutions. Giraffes are gentle creatures and there is something modest about them. I get absorbed in them and as time floats by I wonder about the pleasures of slowness and soon, I am preparing to express this thought photographically with the polite co-operation of the giraffes in front of me. Maasai Mara National Reserve, Kenya. It is the most curious sight. 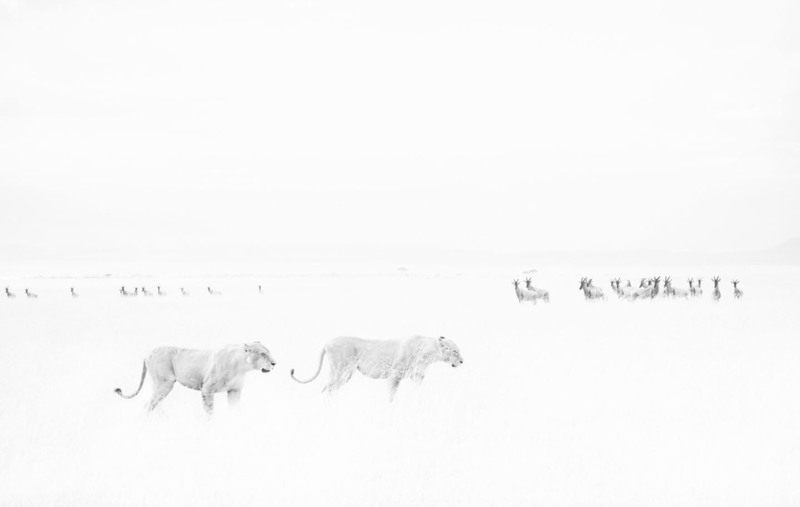 Lions have appeared, walking purposefully, and the grazing topis have noticed, eyes agog, bodies tense and rigid. The lions, although aware of the topis, do not acknowledge them. They are on a mission that only feline minds understand. I am busy executing a composition that juxtapositions sensuous lionesses and alert topis and which hints that harmony lies in safe distances.